Where are you? 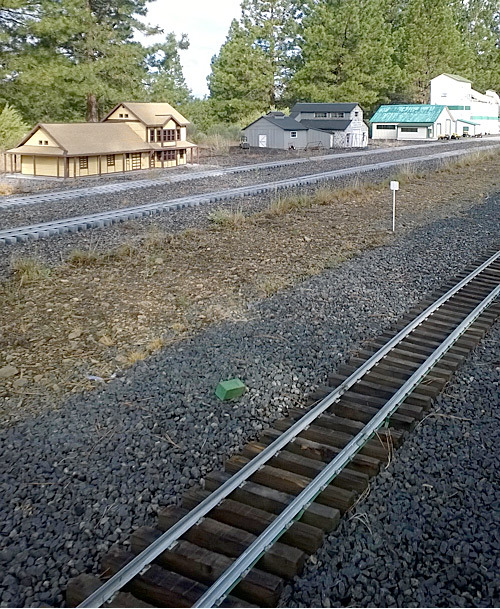 At Train Mountain, the world's largest model railroad, located on 2205 acres near the hamlet of Chiloquin, Oregon, just 19 miles south of Crater Lake National Park and 27 miles north of Klamath Falls, which has an Amtrak station served by the Coast Starlight. In case, like most of us, you don't have a model train of your own, but would like to be part of the action, you are welcome to join the Friends of Train Mountain. These folks do the maintenance on both buildings and the rail line and lay new track, or work at projects such as removing pine needles for fire prevention. Pine cones need to be dealt with too, as some of them, believe it or not, are large enough to derail a model train. Train Mountain was founded in 1987 by Quentin Breen. On adjacent property his friend Ed St John owned a similar model railroad park, called the Over The Hill Model Railroad, connected to Breen's track. The two enjoyed using each other's tracks in a large, unified enterprise. The forested land in the country setting seemed like paradise, and these very fortunate men planned to enjoy their early retirement from lucrative professions by playing with their model trains. But as with most Garden of Eden situations, paradise didn't last. Rumor had it that the wives fell out. Next the connection between tracks on the adjacent property lines was severed. A lawsuit followed. The Klamath Herald and News reported that one of the participants hit another one with her shoe while in the courtroom. So then, with the partnership and friendship between the Breens and the St Johns broken beyond repair, Mr. and Mrs. St John moved away. Meanwhile Breen assembled the two parcels, now together called Train Mountain, and developed over 25 miles of track before he passed away in 2008. Enter the IRS, in 2009, recording $13.8 million dollars of tax liens against the Train Mountain property based on Breen's failure to report and pay required taxes on his former business. In 2010 a lawsuit was initiated, by Train Mountain, to find a way to discharge the IRS liens. The amount owed was reduced. Several members eventually paid off the remaining liens. On May 8, 2013, Friends of Train Mountain was pleased to announce: "THE IRS LIENS ON TRAIN MOUNTAIN ARE ALL COMPLETELY DISCHARGED. Train Mountain now belongs to the Train Mountain Institute. This would not be the last court appearance. One involved a property dispute with a neighboring owner over right-of-way. Before it was settled, one of the owners locked the gate in front of a tunnel and thus blocked the tracks. Another suit was needed to force an heir of the original owner to cease and desist logging trees on the property that no longer belonged to her. The Klamath County Commissioners recently approved a Train Mountain plan to rezone the property so that individual lots can be sold to members who would like to build homes there. Train Mountain Railroad is a club. Membership is reasonably priced and open to anyone interested in railroading. The club operates restricted access tracks on which members can operate their personally owned trains or club owned trains. It maintains the facility in exchange for use of the track and also extends permission to hold train meets on the property. 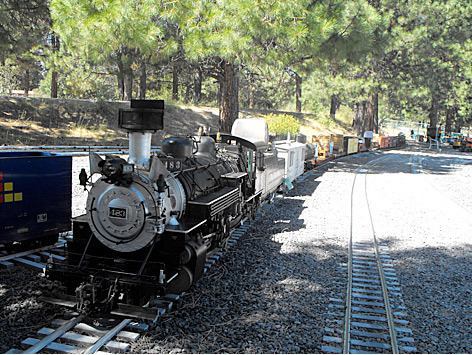 The Klamath & Western Railroad adjacent to Train Mountain provides rides on their model trains to the public every Saturday from 10:00am to 3:00pm from Memorial Day Weekend through Labor Day Weekend. Friends of Train Mountain is a club that works to build more track at Train Mountain. Train Mountain Institute is developing a railroad education program that operates a museum, library and store. These organizations work together to make this World Class Facility succeed. So what is happening here? 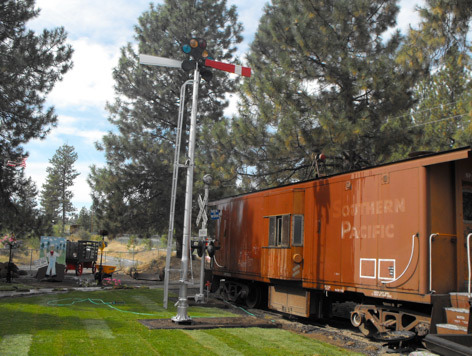 In April 2014, Train Mountain hosted 75 Union Pacific signal supervisors and workers. Their meeting was hosted by the Director of Signals for the entire UP network, whose group traveled out from Nebraska. In May, the Klamath County area Boy Scouts arrived at Train Mountain's Six Acre Campground for a weekend Spring Camporee. They drew the pine needle clean-up chore on Saturday. The railroad owns several "needle cars" to carry the stuff away. Train Mountain Railroad hosts several Work Weeks through the spring and summer. Trains are put to work delivering track to the railhead and ballast to wherever it is needed. We interviewed Hank Castignetti, who recently spent 10 days at a Train Mountain Operations Meet. 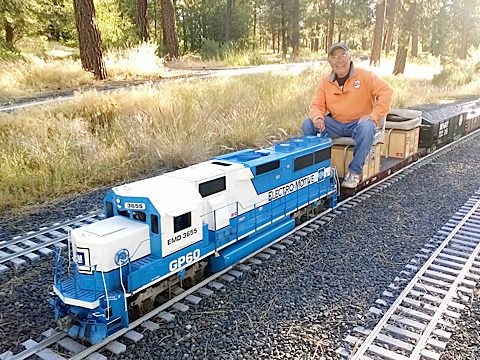 He doesn't own a model train himself, but belongs to the Orange County Model Engineers, which has five miles of track. The organization trailered its own member’s trains to Train Mountain. "There were over 100 volunteers there. There were model rail fans and owners from Canada, Idaho, Seattle, and Texas. Every three years they hold a tri-annual, and one is scheduled for 2015. For those big events, even Australian train buffs put their trains inside shipping containers and bring them over by sea, then trailer them to Train Mountain. "I spent some time 30 feet off the ground on a Cherry Picker inside a building, stripping metal panels off the inside so it can be properly insulated. Some of the volunteers replaced the doors on the building to bring it up to code. "Track laying work is done by the volunteers. The tiny railroad ties are made from recycled plastic. Some other folks worked in the carpentry department repairing the miniature buildings for the tiny villages that decorate the right of way. "Many of the attendees stayed at the railroad's campground. 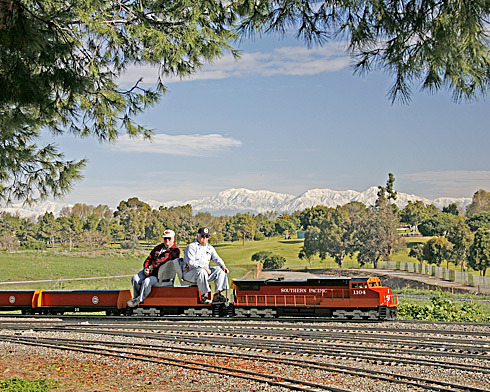 "One feature of the park that is visible from Amtrak's Coast Starlight #14, as well as from Highway 97, is called Caboose Ridge. The park's founder, Quentin Breen, had about 50 full-size cabooses hauled in with the idea of having them available for overnight stays. But the steel walls were not conducive to comfortable inside temperatures. Klamath County degreed that a motel license would need to be acquired, so the idea never materialized. But the caboose collection looks impressive, anyhow." While much of the organization's money comes from volunteers, Hank learned that the wealthy founder, Quentin Breen, was in the cell phone tower business. There are some towers on the property. The phone company leases them and pays Train Mountain for their use. Runs on Saturdays plus Memorial Day and Labor Day Sundays, from May 24th 2014 through August 31st 2014 from 10:00 am to 3:00 pm, (http://www.knwrr.org/) the Klamath & Western Railroad, Inc., at 36951 South Chiloquin Road, Chiloquin, Oregon 97624, 541-783-3177 offers rides to the public. Gauge and scale: The Train Mountain 7 1⁄2 in (190.5 mm) gauge miniature railway track is typically used for 1.5" scale trains (1.5" to 12" or 1/8 scale). Trains of 2.5" scale (2.5" to 12") are also common at Train Mountain. Some of these 2.5" scale steam locomotives can weigh in excess of 3,500 pounds (1,600 kg) for the engine and tender when fully loaded with water and fuel. Train Mountain is located at: 36941 South Chiloquin Road, Chiloquin, Oregon 97624; 1-541-783-3030. Our travel agency, Train Travel Consulting, has been named as one of the World's Top Travel Specialists by Conde Nast Traveler Magazine since 2002. Are you a vacationer who wants to travel at your own pace -- to destinations that you choose?